For the third consecutive year, Great Place to Work has ranked LACNIC among the best companies to work for in the category of up to 150 employees. The organization’s commitment to the open and collective construction of an excellent working environment has allowed placed LACNIC in the eleventh position of this prestigious ranking. Félix Fernández, LACNIC’s Human Resources Manager, added that this recognition highlights the work and professionalism that each member of the organization exhibits daily. “We are very happy because it is the employees themselves who feel this way,” he said. In 2013, Great Place to Work, a study conducted each year in more than 45 countries, ranked LACNIC among the top 10 companies to work for in Uruguay. 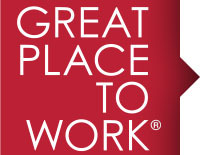 The analysis performed by Great Place to Work is the most in-depth and well-respected study on workplace excellence and leadership practices. Since 2003, it publishes a ranking for Uruguay based on the same methodology it applies worldwide: surveying employees about the level of confidence and the quality of the relationships that exist between themselves and management and assessing company the policies and procedures.